Canadian badminton player Brian Yang won gold at the Youth Olympic Games on Sunday by finishing in the top spot in the mixed team relay event. 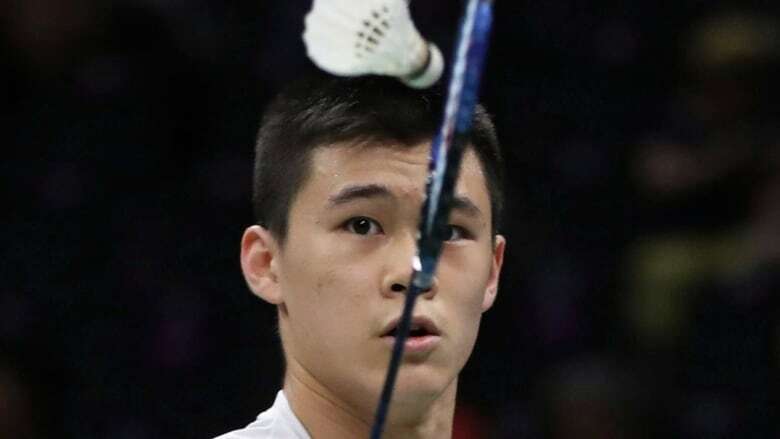 Canadian badminton player Brian Yang won gold at the Youth Olympic Games on Sunday in Buenos Aires by finishing in the top spot in the mixed team relay event. The competition includes 64 players from different countries who are drawn into eight teams. Yang, from Toronto, helped Team Alpha to victory by posting a 22-18 win over Team Zeta's Nhat Nguyen. Team Alpha edged out Team Omega 110-106 for gold and Team Theta took bronze. Also Sunday, judoka Rachel Krapman of Thornhill, Ont., won bronze in the mixed team tournament. She helped Team London tie Team Rio de Janeiro for bronze behind champion Team Beijing and silver medallist Team Athens. Felix Dolci of Laval, Que., furthered Canada's medal haul with his silver-medal performance in the men's rings event. Dolci had the highest execution score of the final (8.866) and scored 13.366 points overall to finish less than .200 points back of Takeru Kitazono of Japan, who took home gold. "I'm incredibly proud to have won a medal at the Youth Olympic Games," said Dolci. "I worked really hard this year on rings and my ability to be consistent in the execution helped me get to the podium."